I have a new favorite dessert. Them be fighting words, people. Favorite is a strong statement. 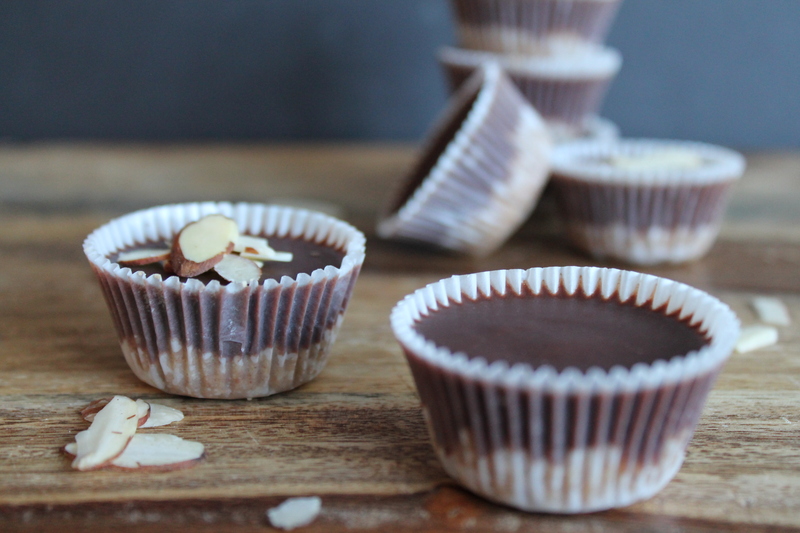 It’s almond butter cups. 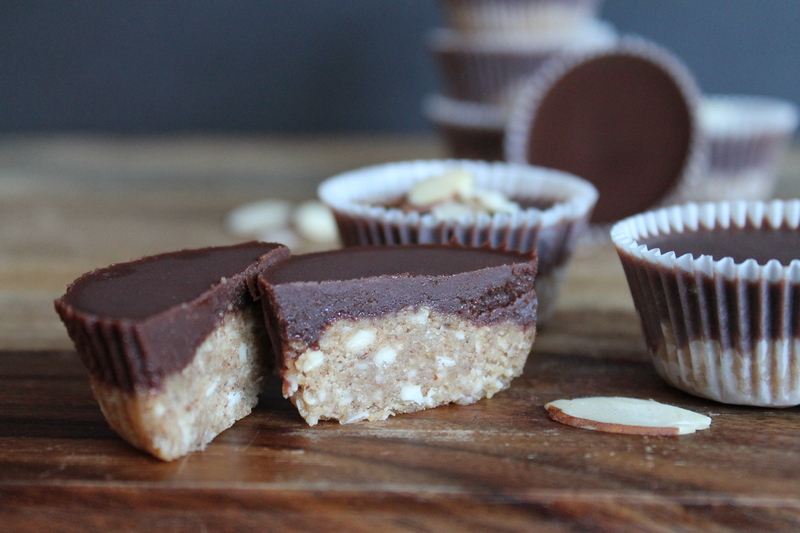 You know, like peanut butter cups, but with almonds. And, surprise! Oats! And coconut oil! And maple syrup! Instead of a dry, crumbly nut center, these cups have an almost cookie-like base with homemade chocolate on top. And the kicker is that they are actually good for you, as far as desserts go! You see, they are full of healthy ingredients like raw cacao powder and raw nuts and unsaturated fats. I swear no one will never eat one of these and think, “This dessert must be healthy.” Every time I set them out for a group of friends, they disappear practically in the blink of an eye. You should make these. You should make them right away! It seems like all of the healthier desserts I know require a food processor. This must be because most of them are full of nuts for protein and healthy fats. 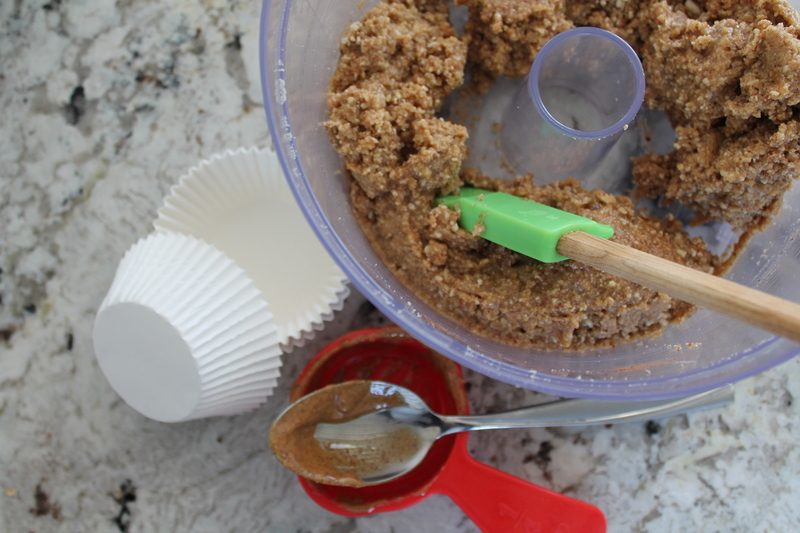 For these cookie cups, I like to give my food processor a little bit of a break by starting with half almond meal and half whole almonds (by weight). The original recipe called for about 4 oz. of whole, raw almonds. I doubled this and now I use 4 oz. almonds (¾ cup) and 4 oz. almond meal (1¼ cups). I think this gives the cookie base a bit more even of a texture, and my poor food processor doesn’t have to work as hard to grind everything up. Combine the nuts/nut flour with oats. I have taken to using certified gluten-free oats in mine (so I can treat a friend of mine), but feel free to go with regular, old-fashioned oats if you don’t know anyone who is a celiac! 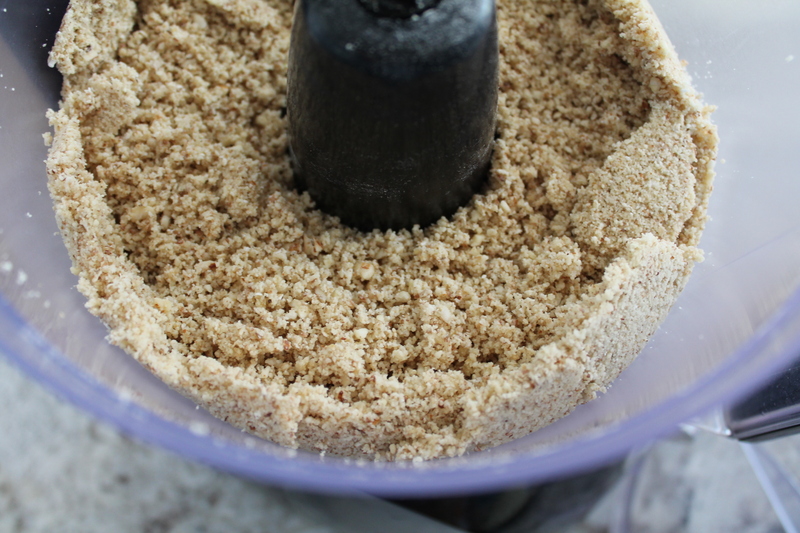 Whiz the nuts and oats in the food processor until a fine, even meal forms. Don’t stress too much about a few bigger pieces of almond (meaning: it’s okay to give up before everything turns into powder), but there should be nothing bigger than, say, a coarse grain of salt. Add the almond butter, cinnamon, vanilla, a pinch of sea salt, maple syrup, and coconut oil. For almond butter: look for a brand that consists of just almonds and salt, with no added oils or sugars. I do not melt my coconut oil before adding it, as mine is generally very soft at room temperature, but if you store your coconut oil in the fridge or if yours is very solid, then you should warm it until it barely begins to melt before adding to the almond mixture. Whiz this again in the food processor until it is thick and even. Next, you must decide whether to make mini cups or large cups. I definitely recommend using paper liners, and you can make this recipe work with either size! I obviously took pictures of mini cups, but I really prefer to make the larger size in a standard muffin tin, because it requires less effort and measuring. Also, you get a slightly larger dessert. I’m just saying. 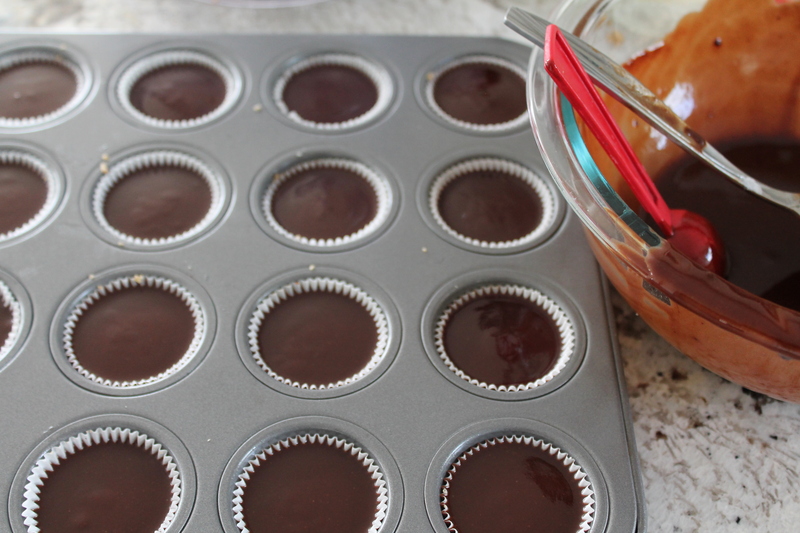 If you choose to make mini cups: this recipe will make 36 mini cups. You could try to simply divide the mixture into 36 smalls, but if that seems crazy or impossible to you (as it did to me), then you can grab a measuring spoon and scoop 2 level teaspoons into each paper liner. Press the cookie mixture evenly into the bottoms of the cups. And before you ask, of course you can substitute ingredients if you are so inclined! Regular cocoa powder works just as well as raw; you could potentially use butter if you don’t care about these treats being vegan; you could even use honey or agave or simple syrup if you don’t have enough maple on hand. For that matter, you could melt up a handful of chocolate chips and call it a day. But I love the less refined ingredients, so that’s what I recommend! As I mentioned earlier, my coconut oil is usually very soft at room temperature. I like to stir all of the chocolate ingredients together at room temperature, then microwave for 5-10 seconds in order to soften the coconut oil just slightly and make a thick, melty chocolate mixture. For mini cups, spoon 1½ tsp. chocolate over the almond mixture. There will be a small amount left over, which you can drizzle into any cups that look a little short. For large cups, spoon a scant 1 tbsp. over the cups. I use my cookie scoop, which is just barely holds 1 tbsp. liquid. The chocolate mixture should spread and smooth on its own, but you can help it to the edges of the cup with a spoon if need be. Place the cookie cups in the refrigerator to set. The chocolate will always be very soft at room temperature, because of the coconut oil, so you should store them in the fridge or the freezer and serve them cold. I do like to eat them right out of the freezer. Yum. Please note: it will not work out well for you if you stick the cookie cups directly into the freezer, thinking that you want to store them there long term. For some reason, every time I have ever frozen these cookie cups directly, the maple syrup has separated from the coconut oil, resulting in a thin soupy layer of syrup drooling out of the cups and. Please let these set in the fridge before freezing them. As I said, this might just be my new favorite dessert. I’ve certainly gone through my share of coconut oil, maple syrup, and almonds making batch after batch in the last few weeks! Make the cookie base first. Combine the almonds and/or almond meal with the oats in a large food processor. Process until a fine, crumbly meal forms (there may be a few larger bits of almonds, which is okay as long as most of the mixture looks like sand). Add the almond butter, room temperature coconut oil, maple syrup, cinnamon, vanilla, and salt. Process until the mixture comes together as a thick, wet dough. Line either two standard size or a mini size muffin tin with the appropriate paper liners. For large cups (standard size muffin tin), divide the almond mixture into 24 roughly equal chunks, either by cutting into segments or measuring approximately by tablespoons. 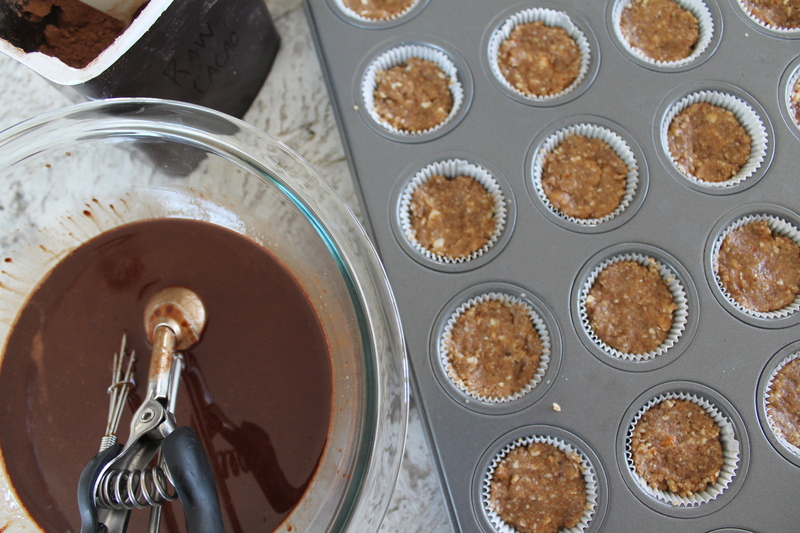 For small cups (mini muffin tin), divide the almond mixture into 36 equal chunks, or 2 tsp. each. 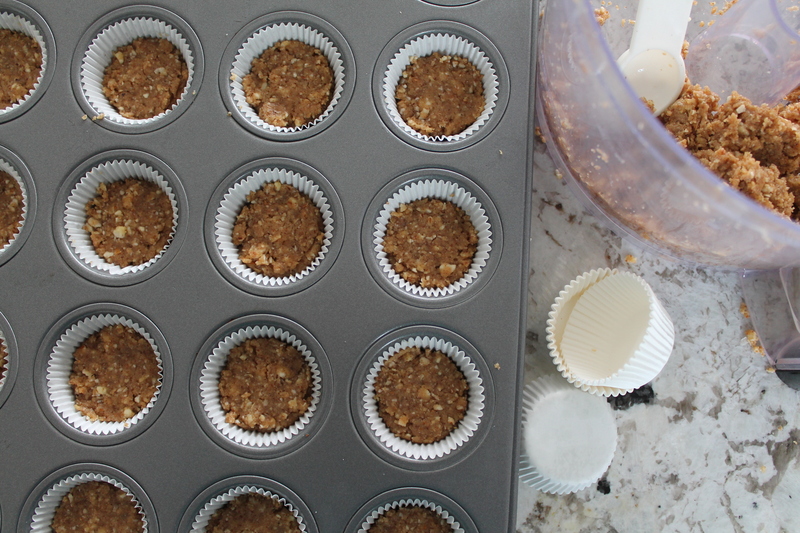 Press the almond mixture into the bottoms of the prepared muffin tin(s) to make a flat cookie base. Set this aside. Prepare the chocolate. Combine the coconut oil, maple syrup, and cacao powder with a pinch of fine grain salt in a medium bowl. Stir to combine. If the mixture is thick or lumpy, microwave in 5 second bursts, stirring well in between, until it is completely smooth. Measure the chocolate into the muffin cups, pouring over top of the cookie base. For large (standard tin) size cups, measure a scant 1 tbsp. ; for small (mini tin) cups, measure about 1½ tsp. chocolate. The chocolate should smooth out and flow all the way to the edges of the paper on its own, but feel free to help along any cookie cups that do not have a glossy, flat chocolate topping. Chill the cookie cups about 1 hour in the refrigerator to set. After this, store in the freezer in an airtight container up to 3 weeks. 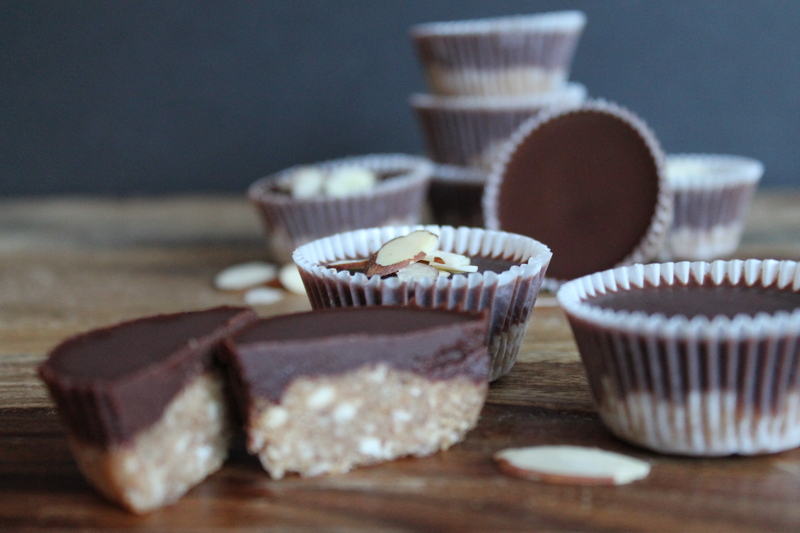 Almond butter cookie cups are best served chilled, as the chocolate will become quite soft at room temperature. *Note: Please use gluten-free oats if you need to manage a true celiac wheat allergy! Great dessert! Thanks for posting. This is more in line with how we eat. My poor baking-loving husband has been morose over our diet changes. I’ll send this his way so he can have something to create over the weekend! Hooray! I hope you guys enjoy them as much as I do!